Underwood Greenhouses has sparked an interest in plant culture for many high school student volunteers. Over the years, the greenhouses have had Girl Scout Troops, Boy Scouts, High School Students, Middle School Students and even Senior Citizens volunteer with the planting. Volunteering at the greenhouses has given students an appreciation of what is involved with growing plants. If you have an interest in plants and have a few moments to spare, please consider volunteering during the months of April and May. of the planting being done the first two weeks of April. If you wish to volunteer at this time, please contact us at: sssala@aol.com. We do not need volunteers at any other time of the year. 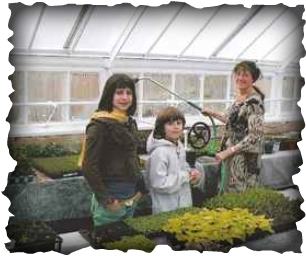 community a chance to learn more about plant culture in an historic greenhouse setting. town Garden Club to use in a fundraiser for community plantings.